The AGP™ pellet insert is easy to use, easy to own and easy to live with. AGP™ stands for ALL GRADES of wood pellets which this insert is designed to burn. Burning multiple grades of pellets is an environmentally sound way to heat your home because the pellets are made from all-natural wood by-products. This insert requires very low maintenance and comes with an easy removal ash pan. Its quick flue disconnect simplifies the little cleaning that needs to be done on the unit. The AGP™’s hopper size allows for more than one bag of pellet fuel and 40-70 pounds of pellets can be loaded into it at once. Its unique horizontal rotary disk feed system (HRD) delivers all grades of pellets without jamming, overfeeding or burn backs. 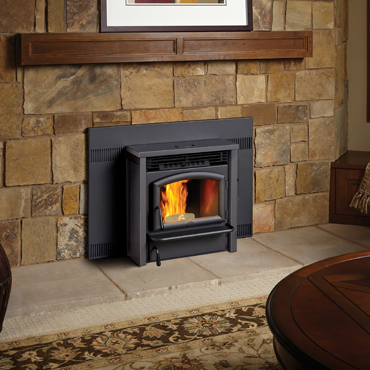 The AGP™ pellet insert is easy to operate and maintain while heating your home efficiently.